'Liverpool - Maritime Mercantile City' consists of six areas that are closely associated with Liverpool's global commercial port, a port that has contributed significantly to the building of the British Empire. 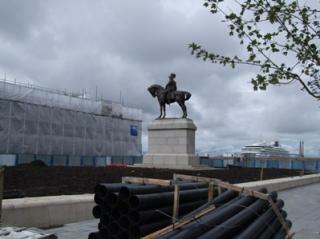 The site contains innovative examples of dock construction and port management from the 18th and 19th centuries. Related constructions include commercial offices, residential properties, warehouses and the docks itself. The prosperity that this trade brought upon the city is reflected in the Cultural Quarter. A group of monumental public buildings was erected here in the (Neo)Classical style. The lavish St. George's Hall (mid 19th century) is the most prominent example of these. Its design is like a Greek temple on the outside, with a Roman interior. 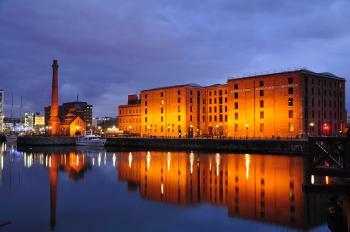 Despite being a WHS ánd European Capital of Culture 2008, Liverpool is hard to love at first sight. I'm afraid they've mistimed the major restoration and construction works that are going on. Everywhere you see cranes and construction workers. The waterfront is hardly accessible at all (looks like they're building a nice promenade though). 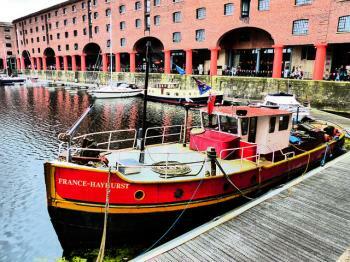 I started my wanderings at Albert Dock. The warehouses and pumping station here are already prettily restored. The main building houses the Maritime Museum, which I thought would be an appropriate start for the day. I do like museums in general, but this one appears to be a favourite for school trips - resulting in running and screaming children everywhere. The displays merely brush the subjects of slave trade, emigration, life at sea, WWII and ship building. The best thing about it that it is free. A few minutes further north along the river is Pier Head: the landmark of Liverpool with the three office buildings Royal Liver, Cunard and Dock Office. They must form an impressive sight when approached by ship. After a good non-authentic Japanese lunch I explored the rest of the city. It's quite a walk to the Cultural Quarter, but certainly worth it. The buildings here look so out of place in this working city: 'over the top classical' I would call their style. Columns and statues everywhere. Definite prize piece is St. George's Hall, almost like The White House in size and stature. Via a small entrance at the lower front it is possible to visit its interior (free again!). The building is used as a combination of a law court and a concert hall. The main hall is a wonderful work of art with granite columns, even more statues and a huge organ. Looking back on this day, I would say that there is plenty on offer for a satisfying WHS visit. However, the maritime story of Liverpool could be explained better and I hope that all new constructions will not obscure the monuments. March 2018 - We arrived in Liverpool late afternoon. Enough time to walk along the docks, see the 3 gracies and get a glimps of the city. Of course we visited the Beatles exhibition first, well actually just the gift shop, went to the Tate Modern in the Albert Docks and marveled at the gigantic early skyscrapers. Liverpool reminded us of a mixture of Hamburg and Seattle. It had a very specific spirit. The area around Cave Club was crowded with drunk tourists, but the harbour area was definitely worth a visit. The next morning we drove along the abandoned factories in the north, that are being discussed at the moment, due to lack of conservation. Nice architecture and very authentic, but who knows how long. The picture was taken 3km north of the centre. I arrived in Liverpool by night ferry from Belfast, and spent a whole day walking around the city. Apart from the Beatles and its 2 football teams, the city is of course famous for being an important port, and you can walk around the waterfront for many hours and enjoy its diverse (and really interesting) museums, especially the Museum of Liverpool and the combined Merseyside Maritime Museum and International Slavery Museum. 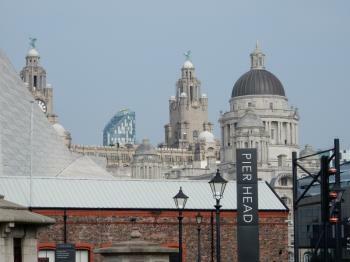 The ensemble of buildings called the Three Graces, on Pier Head, is also quite nice, but can't be visited. The historic value of this site is clear, but today, everything is very touristy, especially around Albert Dock and Pier Head, the heart of the WHS. Some other parts of the city are also included, such as the Cultural Quarter around St. George's Hall and the Lime Street Station. I enjoyed my visit to the city, but its WH values are not immediately apparent. I visited this WHS in June 2016. Unfortunately, what was once an important maritime mercantile city has 'developed' into a consumeristic hub and concrete jungle with never-ending shopping malls, restaurants, diners, pubs all lined up next to each other and all displaying gigantic advertisements everywhere. I failed to see any link or interesting contrast between the old buildings and the new ones. Cranes, dust and pollution reign supreme. The few futuristic buildings which might appeal to some, in my opinion ruin (and are going to ruin further) the view from Albert Dock to Pier Head. The Echo Arena and several possibly interesting museums could have been built elsewhere. Albert Dock is just an empty shell now housing countless diners and junk stores selling the same souvenirs. Apart from a few information boards, there is nothing to explain why this WHS deserves its inscription (perhaps they did this on purpose just in case it gets delisted any time soon!) and the staff at the tourist information offices are more geared towards directing tourists to several free entrance museums and above all to 'important' places for fans of The Beatles. No wonder several photography tours are organised only at night with as little light as possible, at least most of the concrete buildings 'disappear' and there are limited possibilities to help one go back in time and truly understand Liverpool's past importance and how unfortunately it is relatively easy to mess up or even lose a world heritage site! Usually I'm really the type of person to always look for the silver lining even in those WHS which are from being top WHS. Maybe that's why I was too upset with Liverpool as I tried in vain to look for that silver lining in the 6 locations of this WHS but failed miserably. Apart from the inscribed area, I'd recommend visiting the Liverpool Metropolitan Cathedral. Luckily, last year's inscription of the Speicherstadt, Hamburg, covered what in my opinion has been ruined in Liverpool. After my disappointing visit, I promised myself that I would visit Dresden in the near future as most probably it's much more deserving (even with the new bridge!). I visited Liverpool in January 2015 with friends as part of a group celebrating a birthday. We travelled up on the train from London Euston. The WHS inscription shows a very precise border that resembles a gerrymandered political district. I had traced it out onto a map so I could be sure we were going to the correct areas. But first we went to see some sites that are not part of the WHS, yet are worth visiting in their own right. The two cathedrals of Liverpool, both in the Hope area of the city, are both 20th century creations and both cavernous. After the cathedrals we walked to the redeveloped Albert Dock area, where you will find various museums and coffee shops and the famous Liver Building. The reason the city of Liverpool is inscribed as a World Heritage Site is to bear witness to the major world trading centres of the 18th and 19th centuries. Along with the likes of Bristol and Lisbon, Liverpool grew rich on the Triangular Trade, shipping manufactured goods, slaves and tobacco between Europe, Africa and America. Also included within the WHS boundary is the start of the Leeds and Liverpool Canal – a freight superhighway of the 19th century. Although she was impeccably accommodating to my enthusiasm, I detected that my girlfriend Natalie was not too thrilled with being dragged round an industrial estate with no food and a hangover! I have to say that I really like Liverpool especially at night time, it was one of the best sight I have seen during my England tour, not only the port area was well lit with dreamy spotlights, the city center with its many stately buildings were also equally enchanted with similar brightness. I arrived Liverpool quite late from my initial plan, since the rail line from Chester was partially closed for maintenance. The train was packed with young transporters who had tickets for Justin Bieber’s concert! Coincidently the concert venue was located near to the famous Albert’s Dock which also my destination, so I just followed the crowd from Liverpool James Street Station until I saw the iconic Three Graces, the Royal Liver Building, Cunard Building, and Port of Liverpool Building. For me the Royal Liver Building was the most eyes-catching among the group with its clock towers and statues of liver bird. The Port of Liverpool building was also equally impressive with its baroque style; however, the building behind it, the art deco Mersey Tunnel Building was really amazing, its tower was actually a ventilation system for the tunnel! Then I walked along the river to see the Albert’s Deck, I was quite surprised to see the modern Liverpool Museum built here and wondered why UNESCO never complaint about this development. The complex of Albert’s Dock was really contrasted with the Three Grace by brick architecture. I walked around the complex which was full of trendy shops and restaurants, they even had a merry-go-round and a Ferris wheel in the area, the buildings were great but I could not comprehend its maritime heritage much. Then I took a taxi to see the city’s light, I was quite surprised with the quality of architecture in city center that similar to some famous streets in London. The shinny glass dome filled with light at Lime Street Station was my personal favorite. On the next day I walked around the city to see many of its landmarks like Saint George’s Hall, City Hall, listed office buildings. These buildings were really nice and beyond my expectation. I ended the enjoying days in the Liverpudlian pub with a blow of scouse stew, a symbol dish of this city to understand the world of Scousers, before reluctantly caught the last train for London. What I think that the description for this site (Liverpool) lacks is that it was not just a port from which Europeans emmigrated to the Americas, but also a very important stop in the "Triangular Trade" of slavery. A fact reflected by the depiction of an enslaved African on the Town Hall along with other commodities which made Liverpool "The Second City of the Empire" after London. The reviewer also seems to have missed out on visiting the newly opened (August 2007) International Slavery Museum which is also housed at the Albert Dock and is very comprehensive, in detailing both the trade, the effect of human life, the legacy within the UK and in particular in Liverpool which is home to one of the oldest black communities. It acts as both a celbration of the city's diversity and as a memorial to the people who lost thier lives and continue to do so as a result of slavery and ensuing racism. And that is not to mention the Chinese community, Liverpool is also home to the oldest China Town in Europe and has a large traditional Chinese gate given by China as a gift to the city. This is also a result of trade and the foundation of this community is rooted in the City's role as a port. For those still in doubt of the city's role within world history and claim to World Heritage status, let's hope that the new Museum of Liverpool, a massive undertaking due to open in 2010, again on the waterfront - between the Albert Dock and the Three Graces (the Liver Building etc) - will be able to convince you otherwise!! When I visited Liverpool, it was not on the list. I hope they have put up signs to show the things mentioned in the explainations why L is on the list. I agree with Ian Cade that L doesn't seem to be exeptional enough. I hope they can restore the splendour of the buildings that are there but often is in a bad shape. Many nice details are to be discovered everywhere and when in L, don't miss going to Port Sunlight which I think is a nice Garden Town nearby. 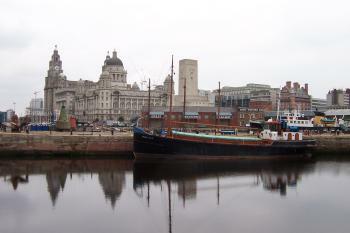 The main part of the WHS is the riverside area Pier Head and Albert Docks, the Pierhead area (pictured) has the most famous building ensemble in the Royal Liver, Cunard and Port Authority buildings. The Albert docks are along the Merseyside a little further and are based around the large enclosed docks, which were one of the first in the world. In this area there are several free museums, the Merseyside Maritime Museum, is the best one to head to for an introduction to what makes Liverpool a "Maritime- Mercantile City" it also has some interesting exhibits on migration, especially of the Ireland- America route, and the lower floor is dedicated to the slave trade which the city played a large role in. The site also encompasses parts of the rest of the city, which has some reasonably grand buildings, and the odd monument here and there, but on the whole I was left wondering if this was really a site worthy of being on the World Heritage List. It is important but I don't know if it is of universal outstanding value. The city is nice, if a little scruffy, and is worth visiting if you want to see that England is not all just Royal castles, it has a distinctive culture and accent and it is a good place to experience, especially if you are interested in the Beatles, but I don't think it is exceptional enough to be a WHS. I managed to spend an afternoon in Liverpool after heading up from Ironbridge Gorge, which is about an hour and a half drive away. If you don't have a car it has plenty of transport connections, it is about 3 hours by train from London or 5 hours by Bus. "due to the proposed construction of Liverpool Waters, a massive redevelopment of the historic docklands"
Tunnels: The entrance to the Queensway Mersey tunnel is inside the inscribed area. When it was built in the 1920's it was significant in World Terms for its length as an underwater tunnel. Inscribed in connection with an anniversary: Inscribed 2007. The 800 year anniversary of founding of the city by the granting of a charter in 1207 by King John fell in 2007. Diplomatic Missions of Joseon Envoy Min Yonghwan: 16 May 1896 (Lunar date 4/4) Overcast ..At 6:00 A.M. we anchored at Liverpool in Britain. From New York to here is 9,400 leagues. For 24 leagues along the river both shores were lined by a continuous stone waterfront. There was a forest of buildings and ships packed close together like fish. It was dazzlingly colorful. Liverpool is densely populated and is the biggest port we have seen since coming to the West. Slavery: Much of Liverpool's 18th Century wealth was derived from the Slave trade. The 3rd floor of the Maritime Museum is operated as the "International Slavery Museum"
Sugar: Sugar from the West Indies and Mauritius was one of the most important of the goods shipped into the port. Nomination File :- "A million tons of sugar and molasses were imported annually from the Caribbean, South Africa and Mauritius, and the second largest sugar silo in the world with a capacity of 150,000 tons was built ... in 1957 for Tate and Lyles" (This, the UK's largest sugar company, had its origins in the city from the company formed there in 1869 by Henry Tate). 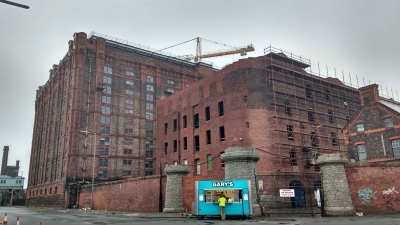 The Nomination File identifies a number of buildings which were connected with the trade including the "Site of the first sugar refinery (sugar house) in Liverpool, a five-storey building erected by Richard Cleveland and Daniel Danvers between 1670 and 1673". Queen Victoria: Statue of Queen Victoria riding side-saddle (1869) outside St Goerge's Hall. There is another of her holding Orb and Mace opposite the Law Courts. Hitler was here: "In his book, The Hitlers of Liverpool, Mike Unger claims the future Fuhrer fled to Merseyside from Vienna, to avoid national service. He says Hitler stayed in a flat in Toxteth with his married half-brother Alois from November 1912 to April 1913"
Naser ed-Din Shah: "We arrived at an open space, alighted, and entered a public building named St. George (St.- George's Hall), where there were a large hall and upper chamber, and on a platform in the hall of which they had arranged a throne, on which we took our seat"
Legends and Folk Myths: The "Liver Bird"
290 Community Members have visited.